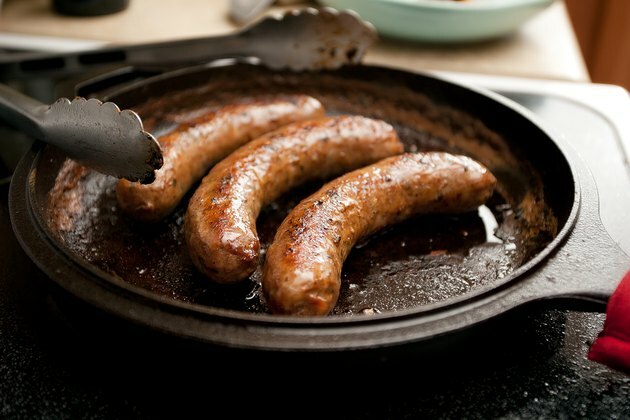 Unlike its precooked counterpart, raw bratwurst sausage is just what the name implies -- uncooked meat that has to be heated through sufficiently for safe consumption. No matter what cooking method you choose, it must be heated to a temperature of at least 165 degrees Fahrenheit. You may grill the links, then cook accompanying vegetables -- such as garlic, onions, mushrooms and peppers -- separately. 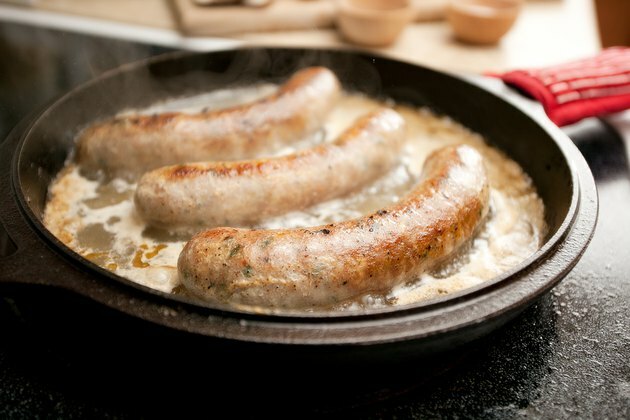 Pan-frying or braising bratwurst gives you the best of both worlds -- a way to cook it to the desired doneness while incorporating other ingredients in the same pan. Coat the skillet with pan spray, or heat butter or oil over medium heat until it's hot but not smoking. 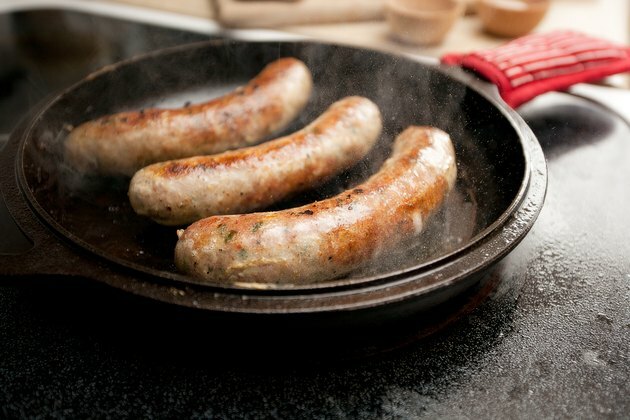 Place the bratwurst in the pan, leaving plenty of space between them, and sear them on all sides until they are a medium brown, about two to three minutes at each turn. Prick the sausages lightly to release some of the fat during cooking. 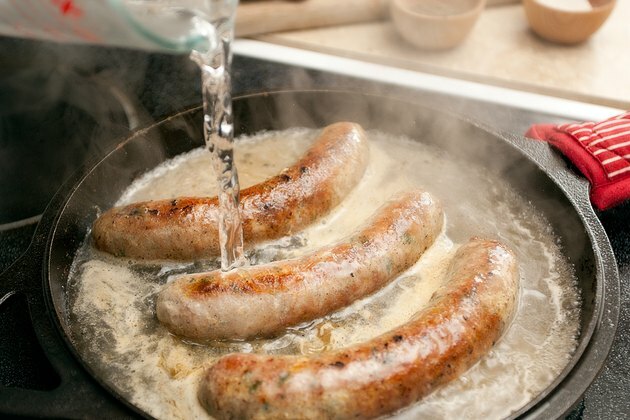 Add about 2 cups water, beer or hard cider, or a combination of 1 part water to 1 part beer or cider, so the liquid comes about halfway up the sides of the sausages. Bring the liquid to a simmer but not a full boil, as this could cause the sausage to split. Cook them for about 15 minutes, turning often to expose all sides to the cooking liquid. Cook until the liquid has been reduced and the bratwurst starts to stick to the pan. Remove the sausage to a platter and cook any seasoning vegetables in the hot drippings until tender and slightly browned. 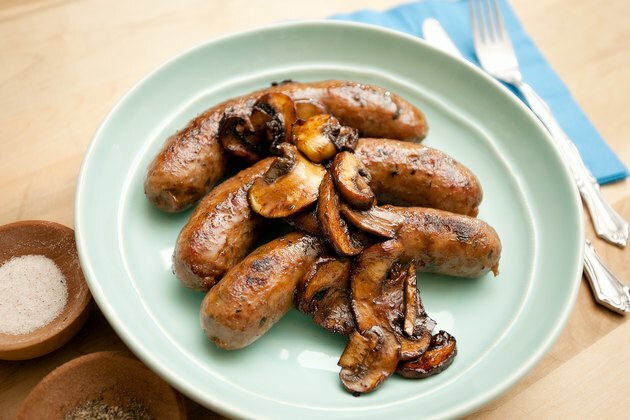 Return the sausages to the pan and heat for one to two minutes longer, or until lightly browned and crispy. Use a meat thermometer to confirm that the brats are cooked completely through to a safe temperature. Remove the pan from the heat and serve the sausages immediately. Reduce the amount by eliminating the initial searing and omitting the beer; simply add water to the pan to start the cooking process. Simmer the sausages for about 10 minutes, pricking them with a knife to release the fat into the liquid. Drain the liquid and place the sausages on paper towels to drain. Coat the pan with cooking spray, and sauté any seasoning vegetables until just tender. Return the brats to the pan and cook them about 10 more minutes or until brown. Serve immediately. Serve bratwurst on sub rolls topped with the seared vegetables and sauerkraut, if desired. Or serve bratwurst with boiled cabbage and steamed new baby potatoes seasoned with melted butter, chopped fresh parsley and salt and pepper. For a fall treat, sauté peeled apple slices in the pan drippings and serve the sausage and apples over hot egg noodles.